Whether you're having a hot cup of tea, an iced coffee, or a fancy Irish coffee, removing the stains can be tricky. A tea or coffee spill is a tannin stain from a plant compound that often shows as a color in the final product. Add the greasy stain from cream and there's even more reason to treat the stain as soon as possible. 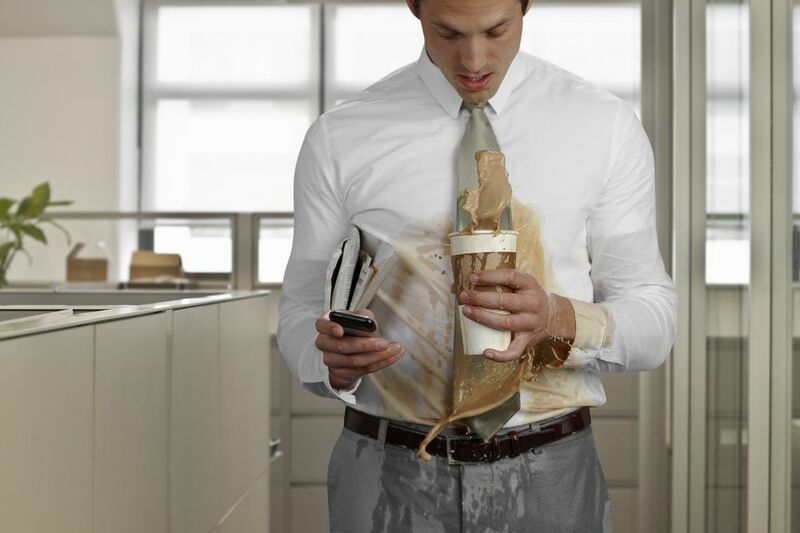 If you have a tea or coffee spill while on the go, blot away the moisture with a plain white paper towel or cloth. Unless the fabric is silk which can watermark, flood the stained area with plain cool water. If possible, flush the stain from the wrong side by holding the stain under a faucet of cold running water. Or, sponge the stain with a white cloth dipped in cool water. If any color remains, you can use a stain remover pen. Just remember that the stained garment will still need to be washed as soon as possible when you get home. Before washing the drink-stained item, pretreat with a bit of heavy-duty liquid detergent like Tide or Persil (these contain enough enzymes to remove the stains) or a stain removal spray or gel. Gently work in the stain remover into the fabric with your fingers or a soft-bristled brush and allow it to work for at least ten minutes before washing. This step is particularly important if the coffee spill contained cream or other added flavorings. Wash following care label directions using a good detergent and the hottest water recommended for the fabric. Never use natural bar soap or soap flakes like Zote on a coffee stain because the soap can make tannin stains more difficult to remove. If the tea or coffee stain is older or has not been removed properly, it may need to be treated with bleach. Chlorine bleach can be used on natural fiber white garments and linens by following product directions. For colored clothes, mix a solution of warm water and oxygen-based bleach (brand names are: OxiClean, Nellie's All Natural Oxygen Brightener, or OXO Brite). Completely submerge the stained garments and allow them to soak for at least four hours or overnight. Then wash as usual. When a tea or coffee stain happens on a garment labeled as dry clean only, blot the stain with a dry white cloth. Sponge lightly with a white cloth damped with plain cold water and blot dry. As soon as possible, head to the cleaner and point out and identify the stain to your professional dry cleaner. When that drink hits the carpet, use a white paper towel or old white cloth to blot up as much of the liquid as possible. Keep blotting until no more moisture is transferred from the carpet to the cloth. It's important to go ahead and treat the stain completely to prevent staining that is more difficult to remove later. Mix a solution of two teaspoons of dishwashing detergent in two cups of warm water. Dip a clean white cloth, sponge, or soft bristle brush in the solution. Working from the outside edge of the stain toward the center to keep it from spreading, work the cleaning solution into the stain. Blot with a dry cloth to absorb the solution, Keep moving to a clean area of the cloth as the stain is transferred. Finish by dipping a clean cloth in plain water to "rinse" the spot. This is especially important because any soapy residue left in the carpet will actually attract more soil. Allow the stain to air dry away from direct heat. Vacuum to lift the carpet fibers. If the stain is older, mix a solution of oxygen-based bleach and cool water following package directions. Dip a clean cloth into the solution and working from the outside edge of the stain toward the center, work the solution into the carpet. Do not overwet. Allow the solution to remain on the stain for at least 30 minutes before blotting away with a dry cloth. Allow the carpet to dry completely and vacuum to restore the pile. The same cleaning solutions and techniques recommended for carpet can be used for coffee stains on upholstery. Take care not to overwet the fabric because excess moisture in the cushions can cause mildew problems. If the upholstery is silk or vintage, it is best to call a professional cleaner especially if you need more stain removal tips. Home cleaning may result in water spots.